Expanded Polystyrene is anaromaticpolymermade from themonomerstyrene, a liquidpetrochemical. 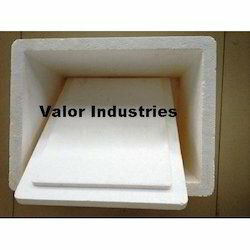 Expanded Polystyrene (EPS) is a convenient, inexpensive and lightweight material to fulfill yourpackaging requirements. Thermacolis one of the most widely used, the scale of its production being several billion kilograms per year. Products made from thermocol are ubiquitous, for example packing materials, insulation, etc. Whether you need to protect valuable products during shipping, maintain a required temperature or humidity level, or simply ensure that products are kept in their original condition, we have a product that will suit you. 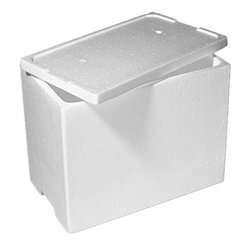 Being one of the top valorous cold chain packaging manufacturer we are now offering different variants of Thermocol box which is popularly known as Thermocol ice box, EPS vegetable box, Thermocol fruit box, Temperature controlled box, Fish Boxes, Thermocol Fabricated box, EPS molded box, EPS for door kit etc. Below mention list does cover small to giant size of boxes almost covering all arena where our product can accommodate its space. We do cater customized molded or fabricated EPS boxes for engineering, hardware, pathology labs etc., as per client’s requirement. Automatic machine molded boxes more than 20 sizes are ready with us. We are offering Thermocol box. Thermocol packing is the most commonly used packing all around the world. We offer our thermocol packing at a reasonable price, it is apt for the packing of a smaller and light weight product or material. Our thermocol packing protects the product and reduces the chances of any damage during transit. We offer clients a wide range of industrial packaging material, customized packaging material, thermocol packaging material & other associated products. Being thermocol based, these feature superior thermal conductivity that protect products from temperature variations & humidity. Being one of the top valorous cold chain packaging manufacturer we are now offering different variants of GELID Thermocol box which is popularly known as medicine box, EPS vegetable box, ice box, Thermocol fruit box, Temperature controlled box, Fish Boxes, Thermocol Fabricated box, EPS molded box, EPS for door kit etc. Below mention list does cover small to giant size of boxes almost covering all arena where our product can accommodate its space. We do cater customized molded or fabricated EPS boxes for engineering, hardware, pathology labs, medical and hospital use etc., as per client's requirement. Below mentioned are the automatic machine molded boxes ready with us. Fish boxes, Vegetable boxes, Fruit boxes, Packing Boxes, Handicraft Box, Packing Material, Thermocol Packing Material, Thermocol Ice Boxes, Ice Boxes, Toys Packaging Materials, Toy Packing Box, Packaging Material, Packaging Box, Industrial Packing Products and Packing Products etc. 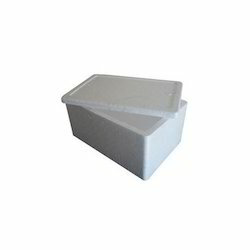 Being one of the top valorous cold chain packaging manufacturer we are now offering different variants of Thermocol box which is popularly known as Thermocol ice box, EPS vegetable box, Thermocol fruit box, Temperature controlled box, Fish Boxes, Thermocol Fabricated box, Expanded Polystyrene molded box, EPS for door kit etc. We do cater customized molded or fabricated EPS boxes for engineering, hardware, pathology labs etc., as per client’s requirement. Below mentioned are the automatic machine molded boxes ready with us. Leading Manufacturer of eps box, eps fish box, eps fruit box, eps packing box and eps ice box from Ahmedabad Gujarat India. Temperature controlled boxes readily available and can be customised as per clients requirement. Being one of the top valorous cold chain packaging manufacturer we are now offering different variants of Thermocol box which is popularly known as Thermocol ice box, EPS vegetable box, Thermocol fruit box, Temperature controlled box, Fish Boxes, Thermocol Fabricated box, EPS molded box, EPS for door kit etc. Below mention list does cover small to giant size of boxes almost covering all arena where our product can accommodate its space. We do cater customized molded or fabricated EPS boxes for engineering, hardware, pathology labs etc., as per client’s requirement. 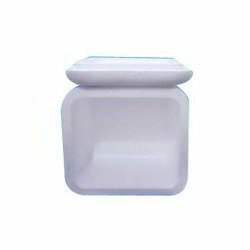 Below mentioned are the automatic machine molded boxes ready with us. Designed to prolong freshness, the Gelid EPS Box manufactured is thermally insulated and protects contents from sudden changes in temperature. 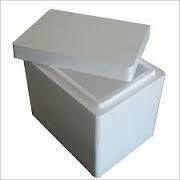 It’s capable to maintain the desired temperature range by arranging gelid ice packs as required. Strength and durability is completely retained even on direct contact with water, allowing hydro-cooling to be an efficient means of preservation. Due to its lightweight design, transportation, handling costs can be saved. The EPS Box is manufactured and supplied, removing the danger of cross-contamination and ensures cleaner deliveries and storage. Looking for Thermocol Box ?